We know that racial disparities exist: By almost every measure of well-being, black people as a group in the United States fare worse than white people do. But how people feel about race and racism, particularly between black and white Americans, is complicated. Although public support for more overt expressions of racism such as segregated public spaces has diminished considerably since Jim Crow, experts say Americans continue to show bias in their racial attitudes, though the explanations the public gives for that bias have changed. During the first half of the century, whites were more likely to blame inequality on biological differences; today they cite cultural explanations. The General Social Survey (GSS) has been asking questions about demographics and social trends, including several questions about race, since it began in 1972. The consistency of the questions over the years means the survey provides a unique look at attitudes about race in the United States, particularly among blacks and whites. (It wasn’t until 2000 that Latinos were surveyed in sufficient number to allow for analysis. Here we’ll look only at black and white respondents.) My colleague Harry Enten pulled survey responses to questions related to race to see what has changed over the years and how the public understands discrimination today, particularly in the South, where racial divides continue to be most stark. Since the 1970s, support for public and political forms of discrimination has shrunk significantly. While 31 percent of white Southerners favored segregated schools in 1972, by 1985, so few people shared that belief that the question was removed from the survey altogether. When whites were asked in 1972 if they would vote for a black president if he were qualified for the job and supported by their affiliated party, 25 percent nationally said they would not. 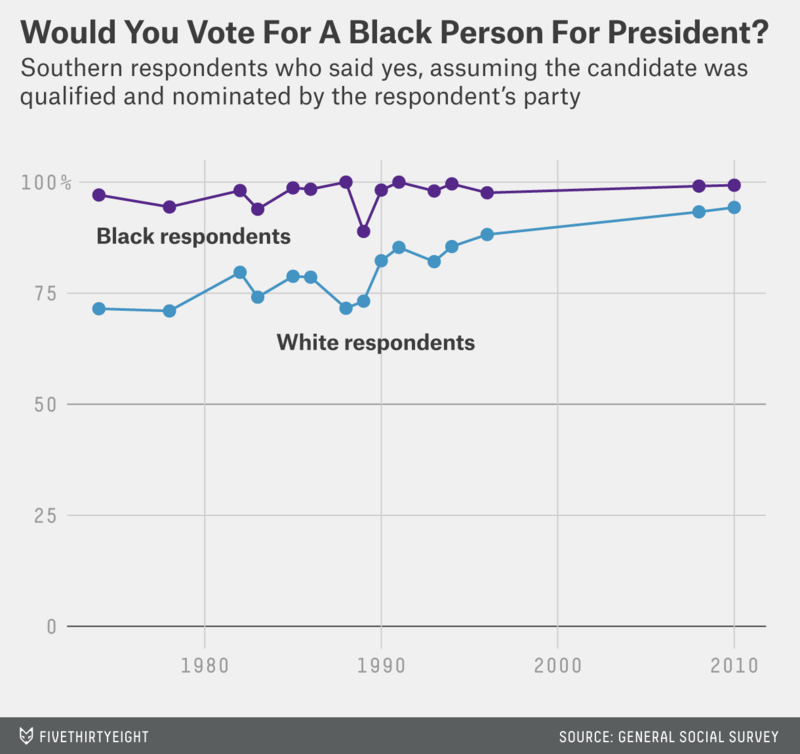 In the South that year, 48 percent of whites said they would not. Compare that to 2010, when just 6 percent of white Southerners said they wouldn’t vote for a black president. Camille Charles, a professor of sociology at the University of Pennsylvania who has studied the GSS, said that the average white person often explained inequality during the Jim Crow era as a result of biological or genetic differences between blacks and whites, but that explanation has largely disappeared. The civil rights movement caused a shift among whites toward understanding inequalities as the result of structural forces, but today, differences are most often explained as cultural. “There was a time when we supported the idea of structural racism, that institutions had policies and procedures that excluded black people. That has given way to a comparable shift to cultural explanations, the idea that blacks are too lazy or unmotivated,” Charles said in a phone interview. A set of survey questions addressing the possible causes of inequality illustrates just that. 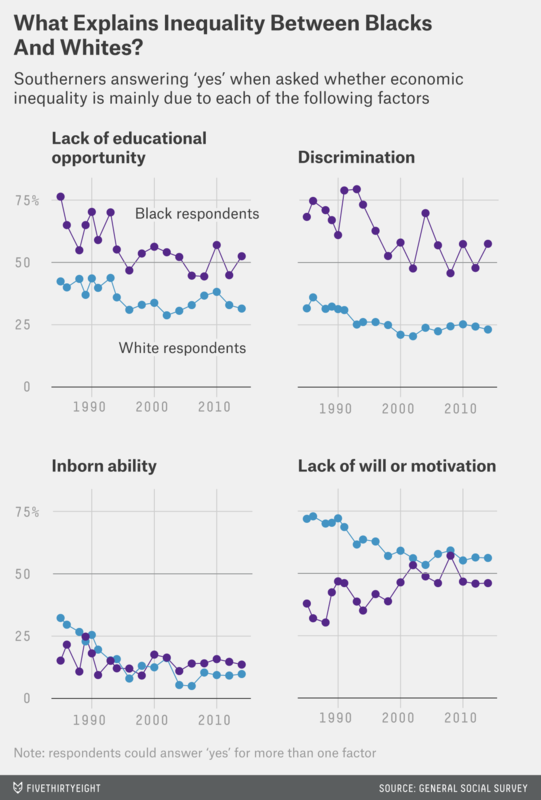 Since 1985, survey respondents have been asked whether they agree with four potential explanations of why blacks have worse jobs, income and housing than whites (they can reply “yes” to as many or as few as they want). The answers of Southern respondents are similar to those of people nationally, but there’s a greater gap between blacks and whites in the South. Very few Southern whites now blame “inborn ability” for racial inequality, and blacks are more likely to endorse structural explanations, such as “discrimination” or “lack of educational opportunity,” than whites. On the question of “lack of motivation or will,” which researchers refer to as cultural, the data is somewhat different. Although whites were always more likely to say this was a major contributor to inequality, the percentage of blacks responding “yes” has increased over the past 30 years, while it has decreased for whites. Maria Krysan, a professor at the University of Illinois at Chicago, has studied racial attitudes and survey methods for 30 years. When asked what the surveys can tell us about racism in the United States, she, like Charles, highlighted the shift away from overtly racist ideas. But she also said the responses may mask more conservative racial attitudes. “The surveys are people’s self-reports of racial attitudes. … In today’s contemporary race relations, there’s pressure to appear not racist, and embrace racial equality,” Krysan said. The GSS is conducted in face-to-face interviews or over the phone. Krysan found in a 1995 study that when people were surveyed anonymously through the mail, they were more likely to express less favorable attitudes toward racial equality. “The more privacy you give a white person to express their attitudes, the less liberal they become,” she said. Another set of questions on attitudes about housing and neighborhoods illustrates a different tension that arises when racial equality is perceived to come at the expense of personal liberty. Respondents were asked to choose between two options on an imaginary communitywide housing vote. One option says that a homeowner cannot refuse to sell to a buyer based on race, and the other says a homeowner can decide whom to sell to, even if she prefers not to sell to African-Americans. It has been illegal to discriminate in home sales for nearly 50 years. In 1978, 70 percent of white Southerners thought a homeowner should be allowed to discriminate, compared with 32 percent of black Southerners. 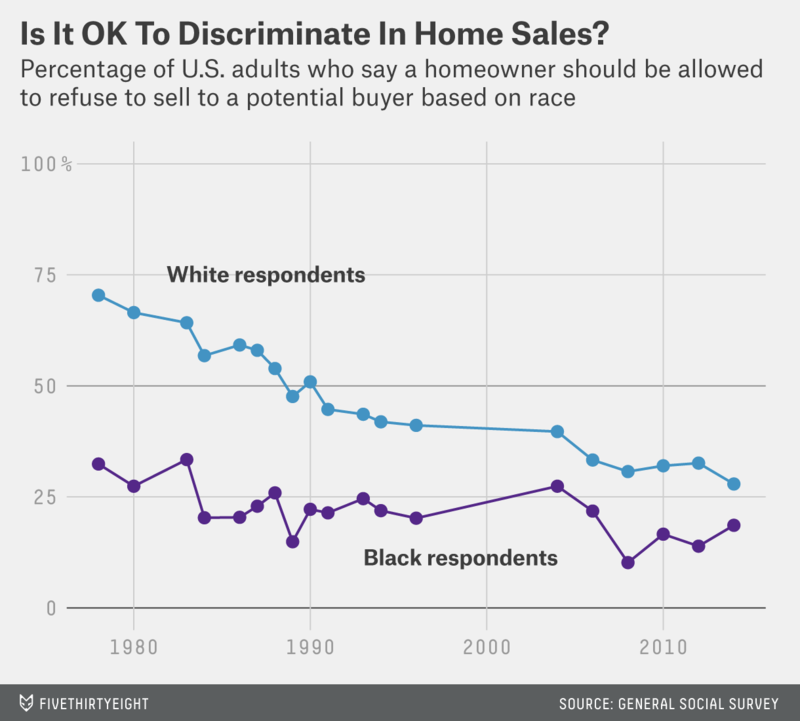 Those numbers have declined significantly, but last year, 28 percent of Southern whites still believed they should be allowed to discriminate based on race when it came to selling their homes.